This time it is according to hospital sources that handled the accident. 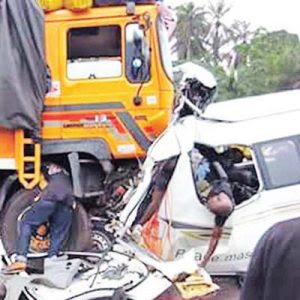 Out of the 15 passengers in that bus, only two people survived – One of the survivors is Mrs. Chidinma Eze, a 32-year-old widow and businesswoman from Ubakala in Abia State. She is based in Port Harcourt. The other survivor is a 33-year-old dealer in cosmetics, based in Aba. And they have shared gory details about the accident below. according to a hospital source. SunNewsonline reports that the first, a two-year-old girl, was travelling with her father. The boy might have traveled with another adult. They all perished in the acci­dent. Their bodies mangled with the body of the bus. The ghastly auto crash happened at the Umuahia end of the Enugu/ Port Harcourt Expressway, precisely at the Ofeme Junction. It involved a MAN-Diesel engine truck, with reg­istration number Plateau JJN 782 XB and a 18-seater Toyota Hiace bus, with registration number, AKL 895 YA, belonging to Peace Mass Trans­port company. The accident, which occurred last Sunday, according to the people at the scene, was the worst in recent times. It was ghastly with heartrend­ing rebounds. “One lady was at the hos­pital the previous day in search of her daughter who bade them good bye that morning before she departed for her school at Enugu. We advised her to visit the mortuary. On her arrival there, she found her daughter among the corpses deposited there. She was devastated and could not believe it was true”. It was as bad as that! It had been reported that all the 15 passengers in the bus died only for people to discover that two among them survived. Speaking to Saturday Sun at the Federal Medical Center, Umuahia where she is recuperating, Chidinma, who sells diesel said that the bus loaded at Peace Mass Transit Central park in Aba and headed for Enugu. She confirmed that there were 15 passengers inside the bus and the windows of the bus were shut be­cause the air-conditioner was on. It was also raining heavily at the time . “Immediately the bus crashed into that trailer, I lost consciousness. Whether the bus sommersalted or not, I didnot know. I can’t even re­member the side through which I was brought out. All I can remember is that I was on the back seat with three other passengers. “We had passed Abia Tower and heading to Okigwe. The driver was driving on a very high speed inside the rain. We entered the bus about 9am, but I did not check the time when we arrived at the spot where the accident occured,” she narrated. The second survivor, Nwodo, was traveling from Aba to his hometown, Akpugo, Enugu State. He had in­formed his parents that he was com­ing to see them that morning and they had even prepared a meal for him.. He boarded the bus to Enugu but it crashed in Umuahia. He had been counted among the dead and was taken inside the pick-up van belong­ing to the FRSC that took the corpses to the hospital. Nwodo was lying among of the dead when suddenly, at the intensive care unit of the hospital, he moved his body. Immediately, he was removed ftom the heap of corps­es inside the van and rushed into the ward for medical attention. When Saturday Sun visited the hospital, he was sleeping. It was said that he could not speak as he was badly wounded from his waist downwards. A hospital source told Satur­day Sun that initially, he could not breathe well until they inserted a pipe inside him to drain bad blood out of his body . Emmanuel, his younger broth­er, who was with him in the hospital, said that one of the doctors called and informed him that his brother was involved in an accident and he came to see him. “I am very happy because the in­formation that was given to them was that everybody died in the acci­dent except two people. I thank God that my brother is among the two survivors. I thank God who knows the reason why he brought him back to life; this is somebody who had al­ready been counted among the dead. “The doctor told me that he has injury in his spinal cord and on the head. Four victims were brought into the hospital alive, but two died after­wards. Among those who died was Obi­diegwu Udogu, the first son of Chief Donald Udogu (SAN), an Aba-based legal practitioner. Tragically too, he died with his two-year-old daughter, Jasmine. A relation told Saturday Sun that Obidiegwu left home that morning with his two-year-old daughter to see his mother in-law who resides in Enugu. Unfortunately, both the father and child did not arrive their destination safely. It was also learnt that the remains of the little girl were buried on Wednesday, while “the family would meet later to decide when Obidiegwu will be buried”.